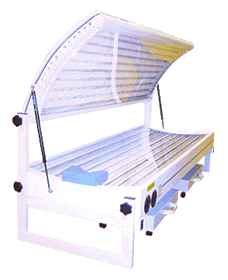 The Elite 18 tube double unit has an ultra modern design, which combines stylish curves and several unique features to provide the ultimate home-use lay down sunbed. These sunbeds are manufactured in Great Britain, using only the highest quality materials and comply with British and European standards. The Elite 9 tube single canopy has a simple but stylish design. Manufactured in Great Britain using only the highest quality materials and wherever possible complying with British and European standards. The VX range of domestic Vertical Tanning Units are designed to maximise full body coverage and produce outstanding tanning results. The new ergonomic shape promotes customer comfort and exceptional performance. The rigid all metal construction incorporates a host of unique features for optimal reliability. These VTU's are manufactured in Great Britain using only the highest quality components and wherever possible comply with latest British and European standards. 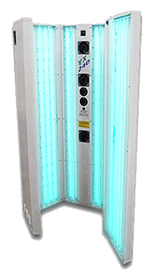 These are the ultimate Vertical Tanning Units, designed for home use. The design incorporates an all metal rigid construction with an hygienic enamel white finish. A host of unique features are including as standard to create these latest high technology domestic Vertical Tanning Units. 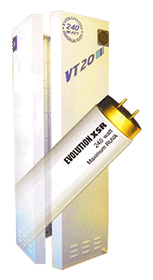 These VTU's are are manufactured in Great Britain using only the highest quality components and where ever possible complies with the latest British and European standards.